If we could be holy, then why would we need Jesus Christ as our Savior? How can we, being filled with carnality and sin, become holy? While we know the purification of our hearts that comes from salvation, is it possible for us to be holy while still filled with actions and thoughts that are contrary to God’s will? Can we be made holy while living among evil? Peter teaches that we are to become holy throughout the books of 1 & 2 Peter. He teaches concerning the HOLY priesthood of believers, and the HOLY nation of God’s children. He says that we are “as living stones, are being built up a spiritual house” in 1 Peter 2:5. Later in verse 9 he says we are “a royal priesthood, a HOLY nation, His own special people”. In 2 Peter 3:11 he says that we should live “in HOLY conduct and godliness” awaiting Jesus’ return. The question then becomes if God wanted us to be holy, why did He not just make us holy? In all His wisdom and might, could the creator not have created us to be faultless? The reason God chose not to do so was so that His power could be seen working in us. The purpose of our lives is to bring glory to God, to reveal Him on the earth. In Romans 9:17 we read the words He spoke to Pharaoh in Exodus 9:16. It says “For this very purpose I have raised you up, that I may show My power in you, and that My name may be declared in all the earth.” We are given opportunity to show the glory of God so that others may come to know Him. The Pharaoh endured ten plagues to show God’s power so that the people would believe in God. Our being made holy also shows His power to allow others to know and believe on Him. In 1 Peter 1:23, Peter says we were “born again, not of corruptible seed, but of incorruptible”. At the time of salvation the Holy Spirit, the incorruptible seed of God, moves in and dwells within us. A seed is planted for the purpose of creating growth. This growth is called sanctification. It is the process of becoming holy - Christ-like. Sanctification does not come from our own power. It is not a work that we do upon ourselves. For if it was, we would only be displaying our power, and that’s not God’s purpose in us. Consider the clay on the potter’s wheel. The clay does not mold and make itself useful. It is the potter’s hands that mold the clay. 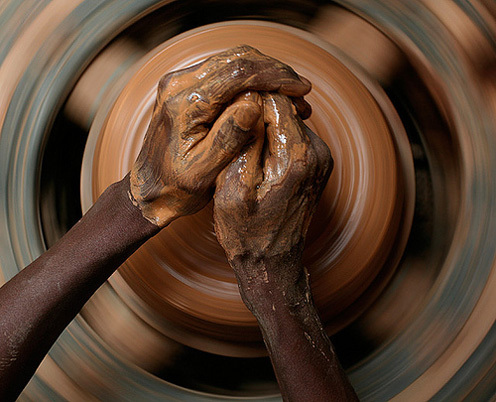 The job of the clay is to submit to the potter’s hands, to be pliable, to conform to the will of the potter. The purpose of the Holy Spirit is to lead and guide us as we are transformed into a holy vessel. He is the potter. Romans 9:23 explains that this is so that “He might make known the riches of His glory on the vessels of mercy”. We are the “vessels of mercy”, those who carry the mercy of salvation. Sanctification’s full purpose is to show the riches and power of God, to display His glory, through our lives. When working with clay, the potter needs three things: clay, water, and a vision of the created work. Man was created from the “dust of the earth”, and is clay. The Holy Spirit is often represented as water. The vision God has for us is to become a holy vessel of His Spirit. We are to displays His craftsmanship, and His power, so that His name will become great upon the earth. This is the work of Sanctification. We are to become the art of God.